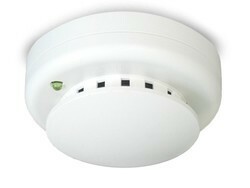 The Kidde 500 & 700 series of conventional smoke detectors are 24Vdc photoelectric smoke detectors designed to be connected to UL compatible fire alarm panels. - Built in drift compensation. Detector adjusts to the environment to reduce false alarms. - CleanMe self diagnostics. Detector will give a trouble indication if not calibrated properly or is dirty. - Field replaceable smoke chamber for easy cleaning. - Magnet test. Alarm the detector with a magent, and even check sensitivity (no meters needed). - Models available with heat sensor and sounder base.